Commemorating the 100th anniversary of the doomed voyage, 2012 Cult Stuff Titanic trading cards trace the history and legend of the ship. Distributed as a 27-card factory set, the cards go back to the Titanic's construction through to its tragic sinking. 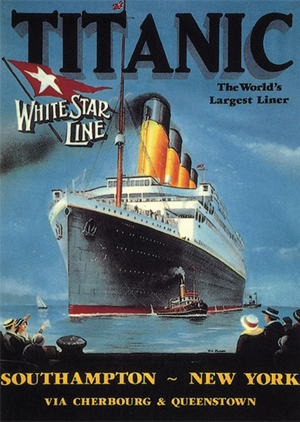 Cards use photographs, original art and paintings from well-known Titanic artists. The hobby edition of 2012 Cult Stuff Titanic cards is limited to 50 ten-set cases. Each case is guaranteed to have a Wreck Wood card featuring a piece of wood from the ship itself. To ensure its authenticity, Cult Stuff purchased it from a reputable collector and has verified the wood's chain of ownership. Other chase cards include a handful of sketch cards, thread cards and fabric cards. A retail version of the set is very similar, but odds for artifact cards are much longer. The price is also lower. While some Wreck Wood cards are in retail sets, they aren't guaranteed like they are in hobby sets. Retail sets also include variation cards and different chase sets. A total of 1,500 retail sets were made. Retail and hobby sets are clearly marked to avoid confusion.